How To. Paint Furniture. Via Young House Love. Home → Affordable Finds → How To. Paint Furniture. Via Young House Love. 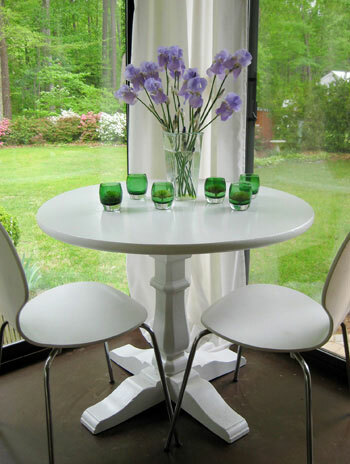 I came across this article, while seaching for a play by play to give hubby to paint some chairs and 2 speakerboxes. (yes, I am using speakerboxes as furniture) I came across this article wrote a few years back and had to re-blog. Very informative and detailed. Step 2- Break out the oil-based primer to ensure that the paint sticks and no stains come through and ruin your finish. Give the entire piece a good once over with a roller or paint brush. This coat of primer doesn’t have to be perfectly even in tone (it’ll probably look thinner in some areas since that’s how primer rolls) but as long as the entire piece is well covered – and it’s not too gloppy and thick – it’s ready for step three once it dries. Step 3- Use a fresh roller or paint brush to apply two thin and even coats of latex paint (a semi-gloss finish is usually best since it’s nice a wipe-able and durable choice). Many people mistakenly think that latex paint isn’t supposed to be applied over oil-based primer, but the result is always great. The real painting no-no is applying latex paint over oil-based paint, which is a guaranteed bubble-fest and should be avoided at all costs. And a word about rollers vs. brushes: according to experts, foam rollers- especially if used too quickly- may rile up the paint and lead to bubbles while paint brushes are the most bubble free application method known to man (even over regular high quality wool or polyester rollers). We painted the table above with a paint brush, not a roller. But we have also used small foam rollers with great success, so those are actually our recommended choice for beginners since they cut down on brush strokes or drippy finishes. No matter what you use, be sure to wait until the first coat of paint is thoroughly dry before applying a second coat (each coat should be applied super lightly and evenly – aim for the thickness of an eggshell or a leaf of paper). This thin application is the key to avoiding brush strokes or roller marks for a smooth, gorgeous finish. Repeat after me: three or even four super thin coats are far better than one or two thick and drippy ones! Step 4- This step is optional, so think of it as extra credit. Brushing on two thin and even coats of water-based poly for wipe-able protection that really goes the extra mile (and a glossy sheen that looks oh-so-luxe) can’t hurt if you pick the right stuff. The only brand that we’ve ever used with unmatched success is Minwax Water-Based Polycrylic Protective Finish in “Clear Gloss,” so that’s our recommendation (other brands can yellow or crack over time). 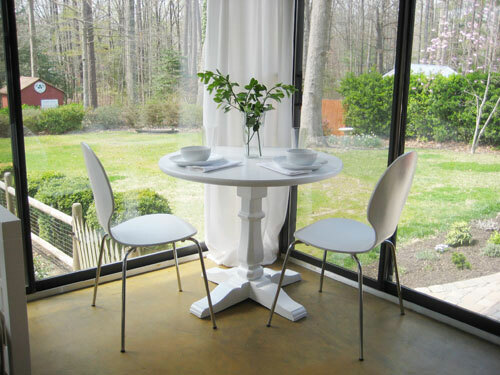 We added the poly to our white table above for a bit of extra protection, and we even poly’d the chairs since they need to be just as easy to wipe down due to their proximity to food whenever we dine in the sunroom. Thin is definitely the operative word, and again you’ll want to be sure to let the first coat thoroughly dry before going in for the second. Any time you go over semi-wet paint or poly to smooth things out you’ll get terrible drag marks, so work from one side to the other and never go back over things until they’re completely dry. 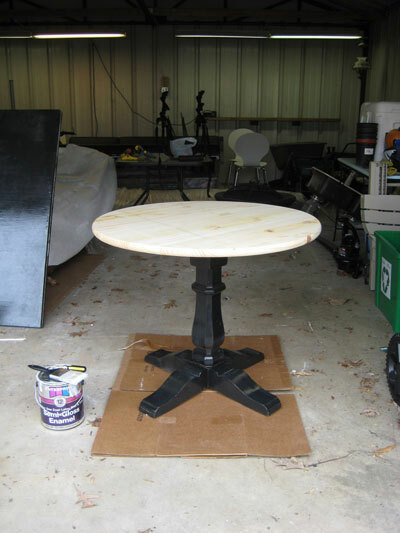 Step 5- Wait at least a full 48 hours to place objects on your newly painted piece to avoid dents or divots in your finish. If you really want to be on the safe side, we’d recommend waiting five full days. Sometimes factors like humidity and primer/paint/poly thickness can keep things from fully curing up, and you don’t want to get indents from using your newly painted piece too quickly. Waiting this long might take some willpower because you’re dying to sit on/eat on/enjoy your brand new piece, but it’s worth the wait. Promise. Easy, right? Ok, those were a lot of words, so it might sound complicated. But just take things one step at a time. And remember to breathe. You can totally do it. There’s really no reason to live with wood furniture that’s not exactly the tone or the shade that you’d like. So from painting an old side table a handsome glossy black to giving a scratched up wooden chair a cheerful red tone, it’s definitely a project that you can confidently take on in an afternoon. Go forth and paint something! *Oh and it bears noting that if your furniture item is anything other than solid wood or veneered wood (like laminate, melamine, etc) you should definitely visit your local hardware store and ask the paint pro there what they recommend for that surface. There are some great oil-based primers and enamel paints out there, so it might be possible to get a semi-durable finish (although none as long-lasting as solid wood and veneered wood paint jobs). The key is really roughing up the surface so it’s less glossy and then priming and painting with the best stuff they have (usually oil or enamel based). Oh and don’t forget to let everything dry for a while so things can cure up and get super durable for the long haul. Good luck!